Richard Sobol calls himself “the Traveling Photographer” because he travels the globe looking for stories. One will agree as you scroll down and read the descriptions of the topics covered in his books. (Breakfast in the Rainforest, Elephant in the Backyard). 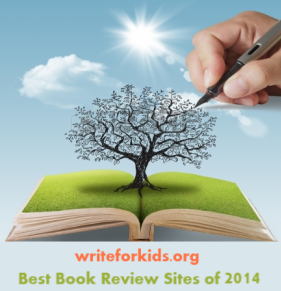 My introduction to Sobol was while serving as a first-round judge for the 2011 Cybils Awards. His book, Mysteries of Anykor Wat was one of the nominees. 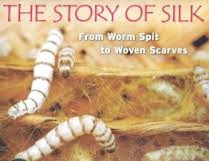 Besides his stunning photography, what I love about Sobol’s books is how he seamlessly incorporates an interesting narrative along with historical details , or as in The Story of Silk, how this sturdy and beautiful fabric is made: from worm spit to woven scarves. “Worms?” “Yes, worms! the farmers replied. “Millions and millions of worms!” For in this tiny village, during the dry season, they make silk. Sobol takes us along as he explains every aspect of the production of silk, from hatching the caterpillar eggs to boiling the cocoons to releasing the silk. The tone of the writing captures the gentle rhythm of the village and how everyone, young and old, work together to create the silk that is essential to their survival. The silk is woven into fabric that is used for their clothing, but also when needed, a product to sell. In all his books Sobol captures the children going about their day. Whether meditating at the temple, playing jump rope, cleaning off the poop from the cocoons or helping with the weaving, we see their smiling faces. There is a glossary and facts about silk. The end papers show a map of the world with Thailand colored in red. The color photographs that grace every page are exquisite; I just wish the book designer had placed the captions directly under the photos, instead of at the top of each page. 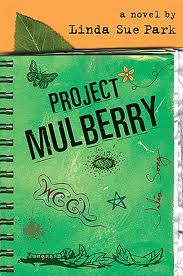 Pair The Story of Silk with Project Mulberry by Linda Sue Park, a fiction title I recommend all the time. The two books make a perfect match. 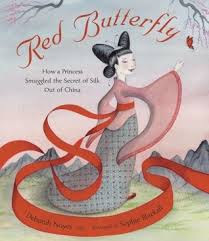 Other great fiction titles include Red Butterfly: how a princess smuggled the secret of silk out of China by Deborah Noyes and Dragons of Silk by Laurence Yep. This books sounds wonderful. I remember having silkworms as a child and climbing our mulberry tree to get the best leaves for them. That is cool, Melissa, that you raised silkworms. These books sound fabulous. My Chinese side of the family was in the silk business before the Communist revolution so I want my kids to read this book. I am sure your children will like the book.